Envision Festival Drops the Wildest Lineup Ever Delivered to the Jungle for 2019! Home » Bon Vivant » Envision Festival Drops the Wildest Lineup Ever Delivered to the Jungle for 2019! 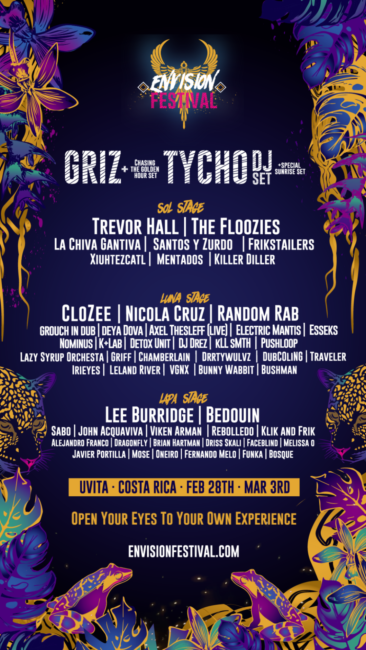 Today Envision Festival announced the 2019 music lineup for the ninth edition of this community built 4-day music & arts festival on the Pacific Coast of Costa Rica. Held between February 28th and March 3rd in a gorgeous ocean adjacent jungle in paradise, the announcement continues the festival’s tradition of serving up heavyweight performers alongside stylish, avante garde talent from the most culturally rich underground communities in Europe and the Americas. As a known launchpad for Latin America’s top producers and a popular bucket-list item for top shelf tastemakers across the world, Envision is committed to proving that lineups can be culturally diverse and still arrive stacked with a bevy of talent with an unmistakable must-not-miss allure. The festival draws colossal headliners with house and bass music sensations that could easily qualify as ‘legends in the making’, but taken as a whole, this year’s lineup peers even further into the future with artists intentionally selected to awaken the self to a higher consciousness in alignment with the natural harmony; all on three internationally acclaimed, flame-throwing, projection mapped dance music stages built by world-class sculptors and fabricators in collaboration with local Ticos. 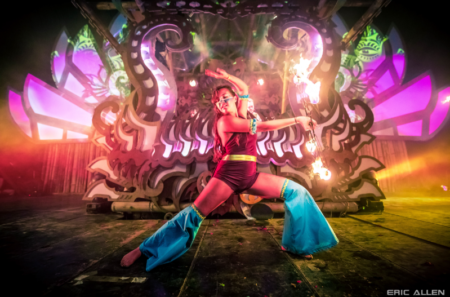 Challenging the status quo, Envision 2019 is a music and art festival, locally crafted to deliver a new, holistic spin on the conventional music listening experience. Progressive icons of social consciousness like Australian sacred bass specialist Deya Dova and Denver-based climate activist Xiuhtezcatl emphasize vision found in the 8 pillars of the event, while featured headliners like the Hawaiian hybrid, Trevor Hall, continue a tradition of flavorful folk, reggae and roots. Elektro funk pioneers, The Floozies, will also serve up jams from the jazz capital in the heart of Kansas. San Francisco’s Tycho, is set to present a smooth psychedelic ambiance alongside the dark house beats from Bedouin, for a delightful combination of sweet and savory that is seldom experienced in the jungle. Next, Envision delivers the sounds of Burning Man, with timeless legend of Robot Heart and ‘All Day I Dream’ leader, Lee Burridge alongside the latin house fusion aficionado fresh off the Mayan Warrior, Nicola Cruz. Then Sabo, the globally recognized dance music legend stops by with a tropical flair we’ve all come to love about the event. CloZee makes her 4th appearance at the festival, both as a fan favorite and as France’s most valued export in kundalini-blasting bass music. Also from France, the explorer extraordinaire, Viken Arman, will draw on roots in classical, jazz and ancient rhythms. In the final top spot for the phase 1 announce, Envision looks forward to introducing Detroit original and soul funk marvel Grant Kwiecinski for a must-not-miss debut performance of GRiZ on the Luna Stage. As a haven to bass-lovers and the most advanced display of pyrotechnics among our three masterfully crafted stages, the Luna Stage is a monument to the staggering ingenuity of our teams and the endless creativity of the (almost) all girl build crew at the Reliquarium. In addition to being a banner year for international music at Envision, 2019 is expected to be a celebration of Latin America’s most vibrant and colorful luminaries in dance music. With strong representation from world famous Costa Rican artists like Santos y Zurdo, Faceblind, Bunny Wabbit, Javier Portilla, Melissa O, and Mentados, Latin culture lovers can look forward to ska reggae fusions and the sound of future nostalgia. Signaling a level of intention ahead of its peers Envision is an established pivot for environmentalists in festival culture, aspiring for harmony with nature in Costa Rica and abroad. To this end, numerous initiatives are woven throughout the fabric of the culture at the event, designed to nourish the local communities while protecting the jungles of the region. In an effort to leave a positive footprint, Envision hosts a reforesting program which has planted more than 12,000 trees over the last 7 years. To protect the environment and cut down on waste, ALL single use plastics and outside alcohol are banned, while vendors serving foods onsite pledge to uphold Envision’s commitment to buy locally grown produce for an authentic dining experience that can’t be found anywhere else in the world. Additionally, they offer a dishware rental program and encourage a BYO mentality to repurpose and reuse, with quick clean up stations conveniently located throughout the venue. All the clothing and craft products sold in the market are fashioned by local and international artists with a net positive impact on the environment. 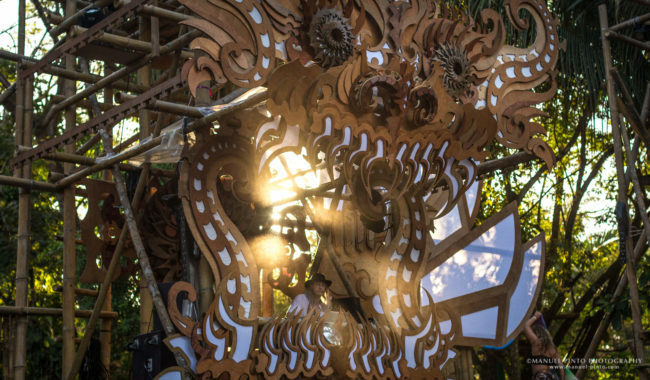 Stages and structures are made the local Tico way, almost entirely with eco-friendly materials harvested from the nearby jungle, in a process they’ve dubbed ‘Jungle-Tek’. Through these efforts and more, Envision upholds an ethos of regenerative celebration that continues to inform everything they do, from what foods are included in a dining experience to which musical story is told on the lineup. Following a very successful presale, less than 300 passes are still available at the current discount and once they’re gone, they’re gone. For any digital nomads looking for the destination experience of a lifetime, or for those couples who didn’t get much time together during Valentine’s Day, Envision is a workshop of inspiration and a medicine for the soul. General admission tickets, Early Arrival passes, and VIP packages are available via their Website, but don’t miss a chance to get one! All tickets are expected to sell out far ahead of schedule. General Admission 4-day tickets are $279 USD plus tax and fees with the option to purchase an Early Arrival Pass add-on for $79, plus tax and fees. For those who like to travel light or just need a little more comfort on the road, there are NEW VIP packages starting at $599 plus tax and fees, including everything from shaded, pre-set up tents to full-fledged treehouses and bungalows. Nothing says ‘king of the jungle’ like living in a tree! RSVP on the Envision 2019 Facebook Event Page and sign up for the newsletter to stay in the loop with upcoming Envision Festival news, application openings, workshop announcements and more. SOL Stage: Griz (+ Chasing the Golden Hour Set), Trevor Hall, The Floozies, Xiuhtezcatl, La Chiva Gantiva, Santos Y Zurdo, Frikstailers, Mentados, Killer Diller. LAPA Stage: Lee Burridge, Bedouin, John Acquaviva, Sabo, Viken Arman, Klik and Frik, Alejandro Franco, Dragonfly, Brian Hartman, Driss Skali, Faceblind, Melissa O, Javier Portilla, Mose, Bunny Wabbit, Bushman Bosque.